Join us for a look at this 14,000 square foot home with a pet shower and spa that is perfect for any large family and their dog! In our newest ‘Home of the Week‘ we move from a lovely downtown home in Corvallis, Oregon to an impressive 14,000 square foot estate in the prestigious Chicago suburb of Oak Brook. This Oak Brook estate offers a truly exceptional style of living. Being set on a 1.6 wooded acre lot means you have your own personal space for quiet and relaxation. What makes the location even better is that this suburban getaway is mere minutes away from all that downtown Chicago has to offer. The interior of this enormous home is not to be missed. A grand staircase greets you as you enter the awe-inspiring foyeur, setting the tone for what is a wonderfully elegant and warm interior. Three extraordinary levels offer formal living and dining rooms, nine fireplaces, huge bedrooms and spa-like baths. Other features include a wine cellar, garage for 11 cars, offices and a separate 2,100 square foot Coach House! The kitchen is at the heart of mostly every home, and this $3,199,999 dollar home has a state of the art chefs kitchen that would surely be at the center of memorable meals and lively family conversation. To top all of that off, the estate boasts a separate pet shower and spa that your furry four legged friends would surely love. With a puppy shower and all the space offered at 3108 White Oak Lane, this would be the perfect home for any large family and their pet. 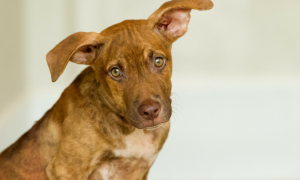 Looking to give an adoptable dog a forever home? This weekend, August 1-2, we’re partnering with adoptapet.com to host the biggest adoption event of the year. For more information visit adoptapet.com/homesfordogs. Click here for more information on this dog-friendly estate listed by Chaz Walters with Coldwell Banker Residential Brokerage. 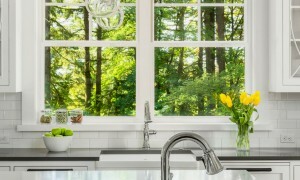 You can have your white kitchen and visual interest too. 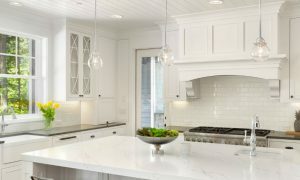 Use these ideas to make your cooking space stand out.